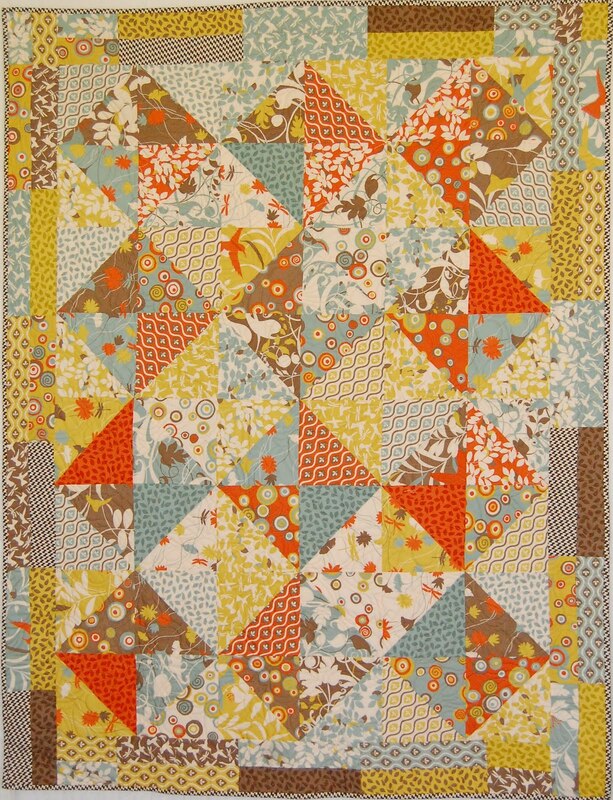 Lap Quilt "In a Jiffy"
My name is Kari Ramsay and I am the designer of Fresh Cut Quilts Pattern Co. I am new to the world of posting Tutorials here, and it is a great pleasure of mine to bring you this one. 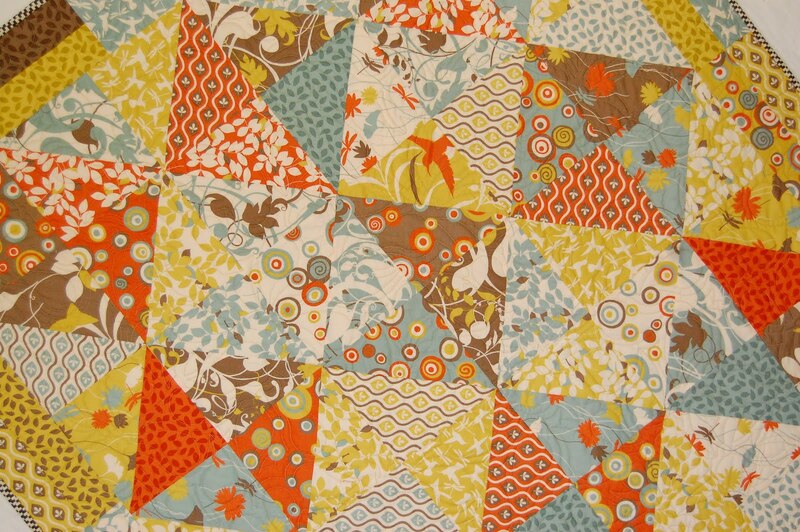 This is a great lap quilt to make when you need a gift or a fun project in a jiffy! It goes together very quickly, and I think you are going to love it! 1 Arcadia Layer Cake or a different equally cute Layer Cake! 1. Separate your Layer Cake into two stacks of light and dark fabrics. Some may not be considered a ‘dark’ fabric, but if the color has a strong contrast to the light fabrics it will work great. 2. 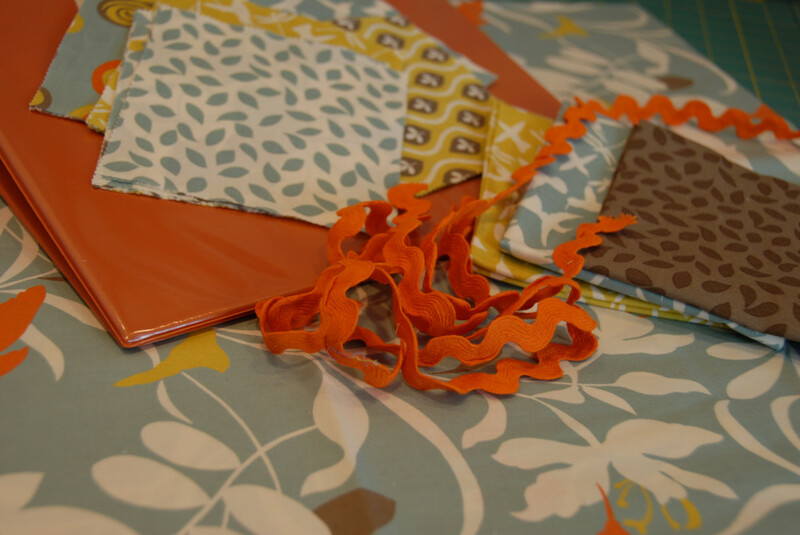 Choose 12 of the light fabric 10″ squares, and 12 dark fabric 10″ squares. Set aside. 3. The remaining 16 squares will be used for the outer border. 4. Take one light and one dark square and place them with right sides together. Pin around the squares in several places to secure the squares. 5. 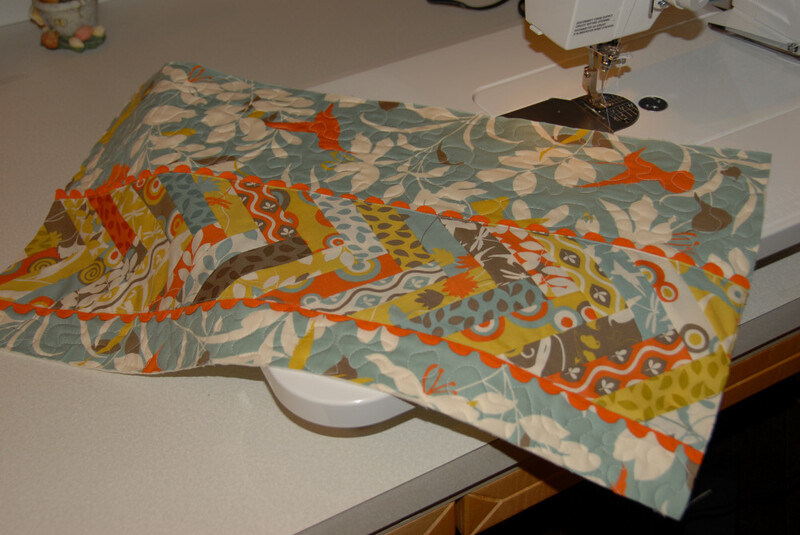 Sew the squares together on one side with a 1/4″ seam. 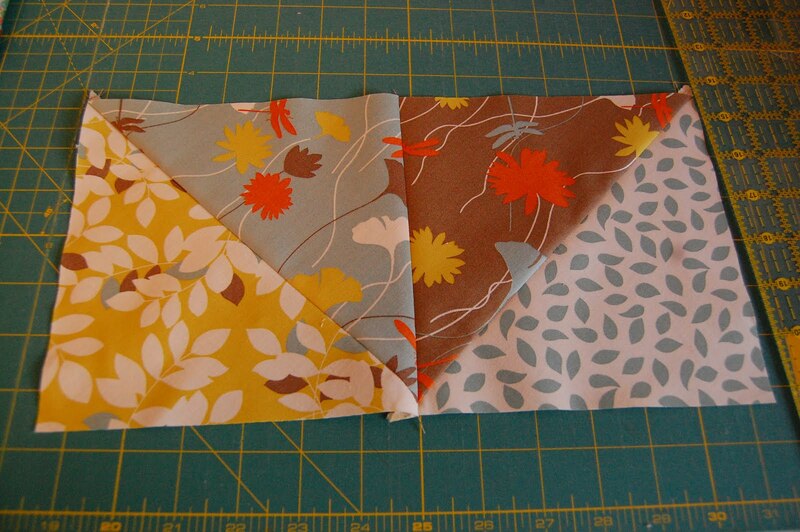 Then continue to sew around the squares until all four sides have been sewn. 6. Spray both sides of the square with Mary Ellen’s Spray Starch and press the block. This will help keep your bias edges from stretching or moving in the next steps. 7. 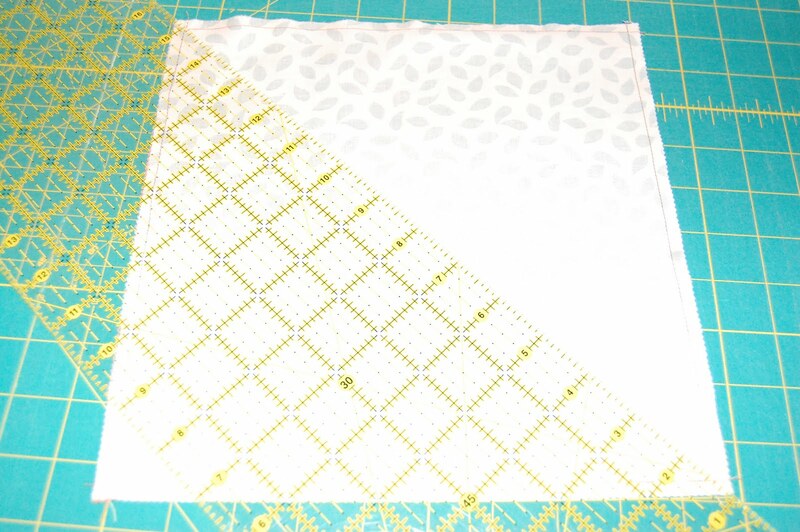 Take your long acrylic ruler and line it up to cut the square block diagonally from corner to corner. Then make one more diagonal cut from the opposite corner to corner. This will yield four Half Square Triangles that are identical. Press the seams toward the darker fabric. Repeat steps 4-7 with the remaining squares. 9. Choose 4 different Half Square Triangles. Place two of the HST’s with the right sides of the darker fabric facing. Pin into place. 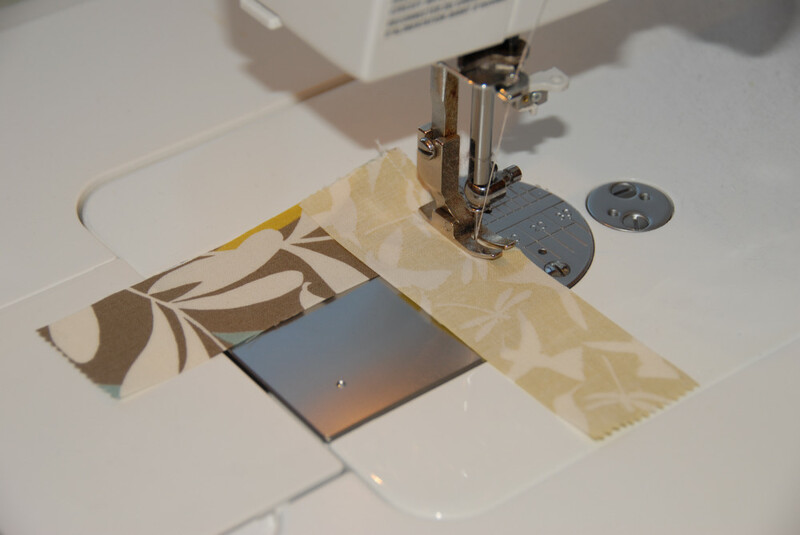 Sew a 1/4″ along the raw edge. Repeat with the remaining two HST’s. Press the seams in opposite directions. Be careful not to push or pull on the triangles when they are moving through your machine. Let your feed dogs do all the work and you won’t have any trouble with the fabric stretching. 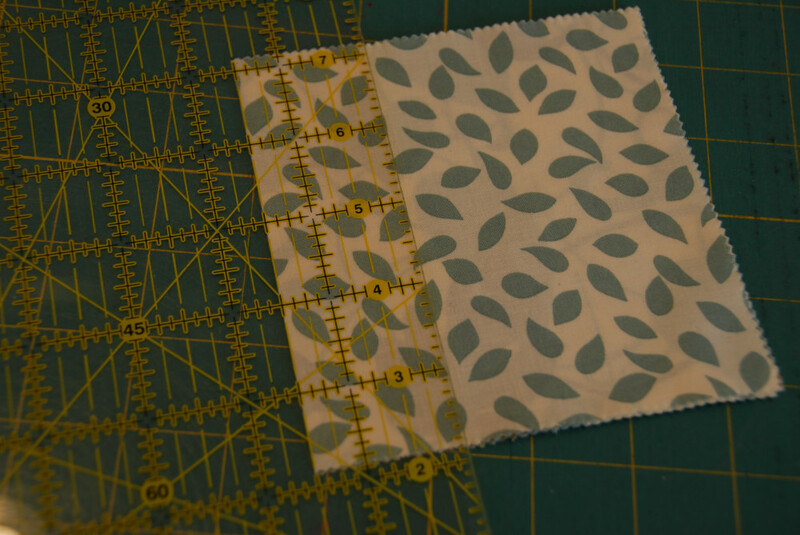 Also, be sure with these blocks not to use your thread cutter on the side of your machine- that will stress the fabric in the wrong directions. With these blocks you will be placing all of the darker fabrics to face the center of the block. 10. 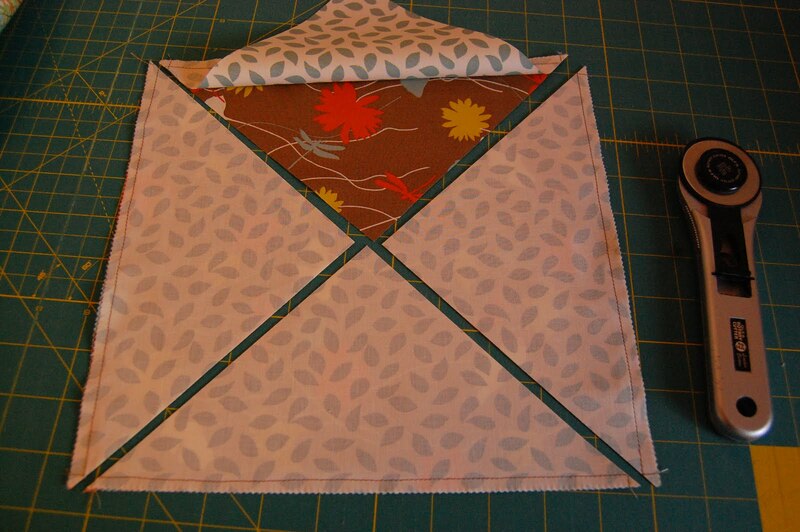 Place the two halves of the block with right sides together and pin in place along the raw edge. 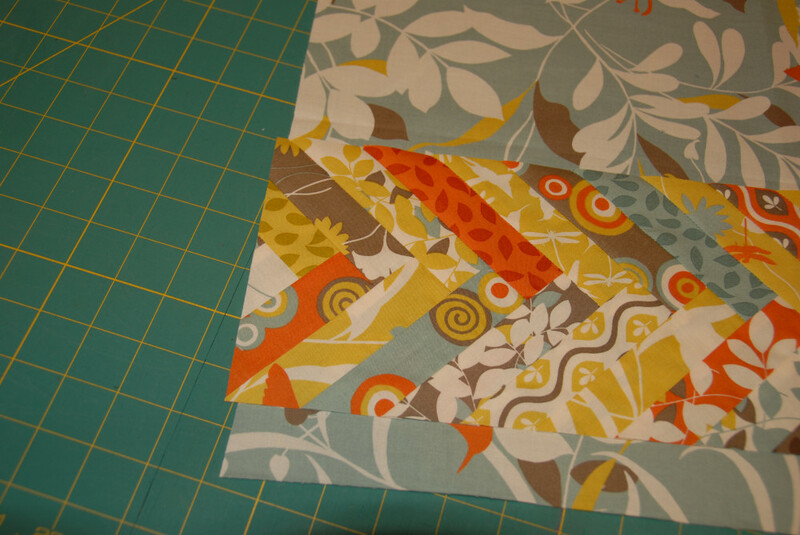 Sew the two halves of the block together. Press the seam. 11. 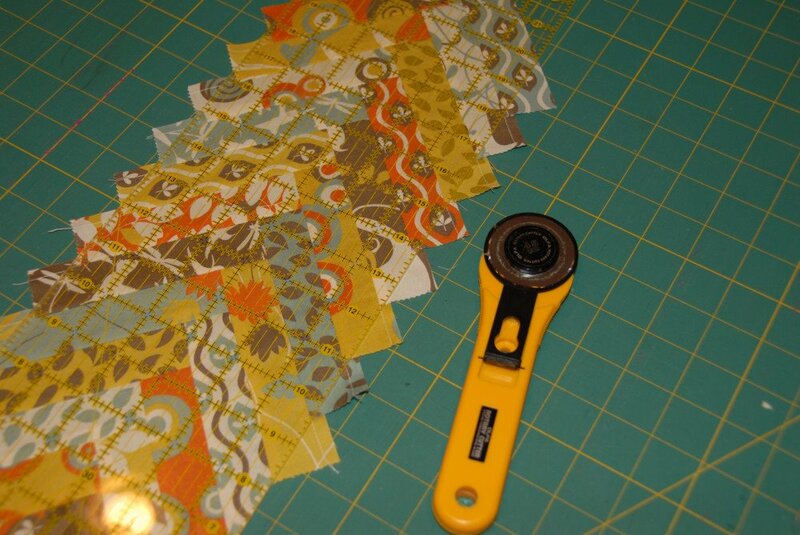 Repeat with the remaining HST’s to create 12 blocks measuring 12 1/2″ square. 12. Sew the blocks together into 4 rows of 3 blocks each. 13. 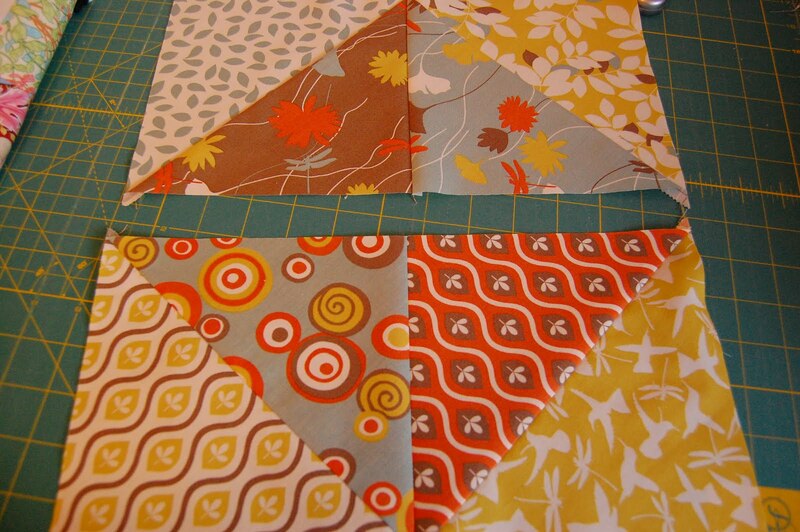 Take the 16 squares set aside for the border and cut each square into (4) 2 1/2″ x 10″ pieces. 14. 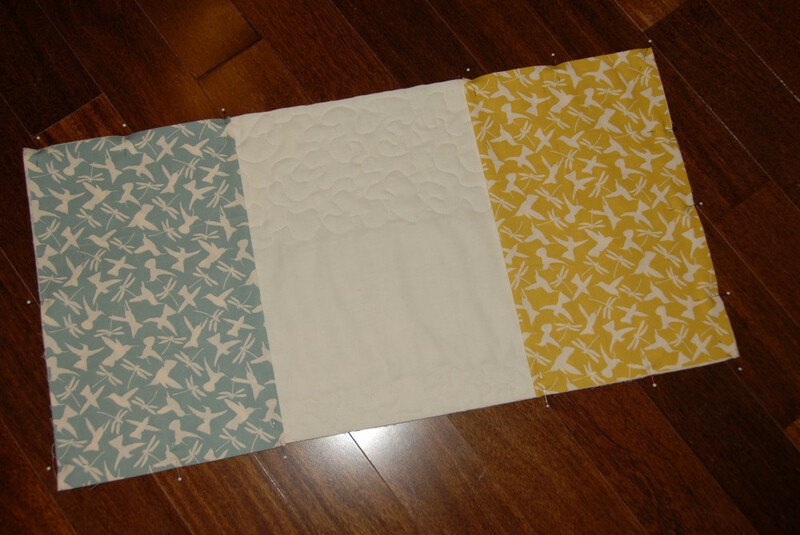 Pair up different border pieces and sew them together along the 10″ length of the pieces. Press the seam. 15. 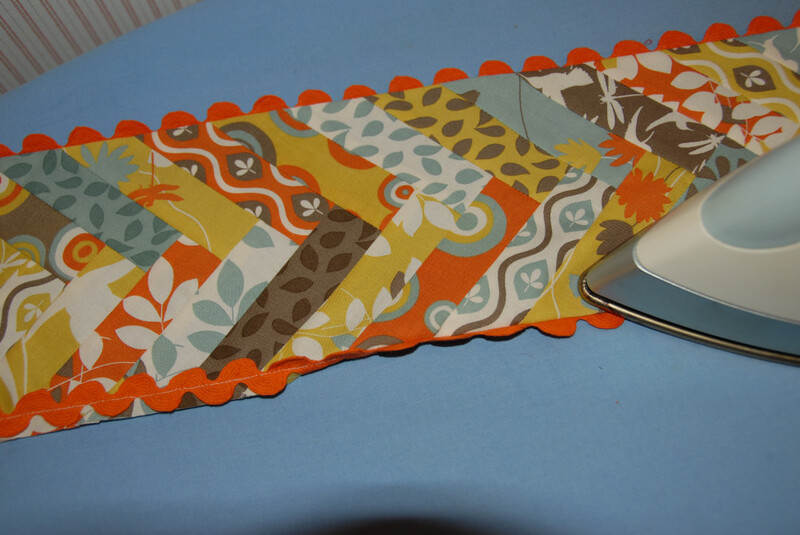 Sew 5 of these border segments together on the 4 1/2″ side end to end to create one long border piece. 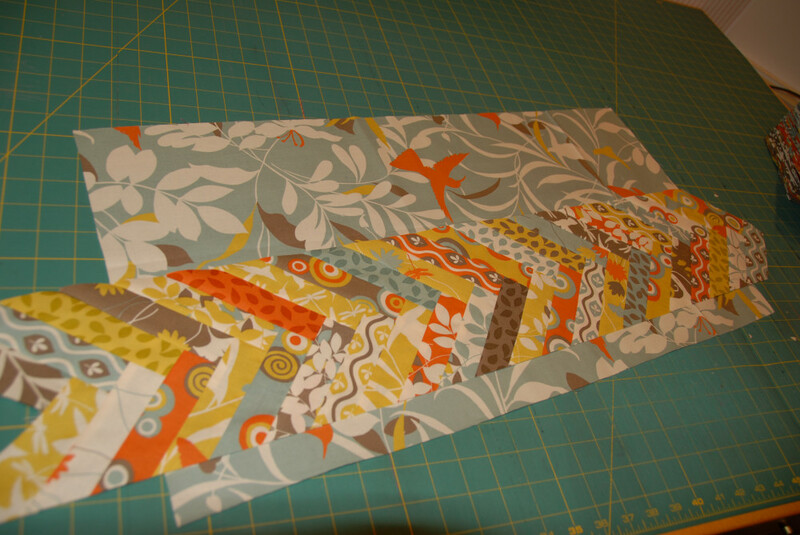 Repeat and make one more with 5 border segments, and two more with 7 border segments in each. These are your borders. 16. 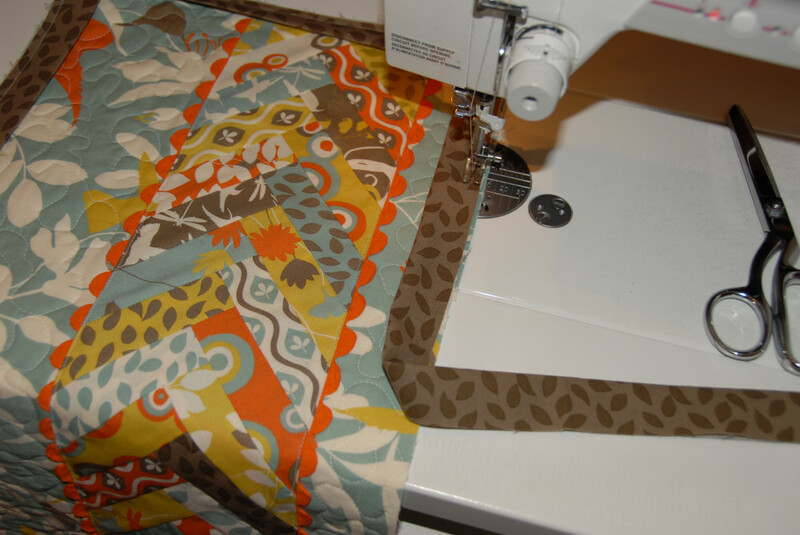 Measure the quilt horizontally from side to side to determine the top and bottom border lengths. Cut the two borders with 5 segments to that length. 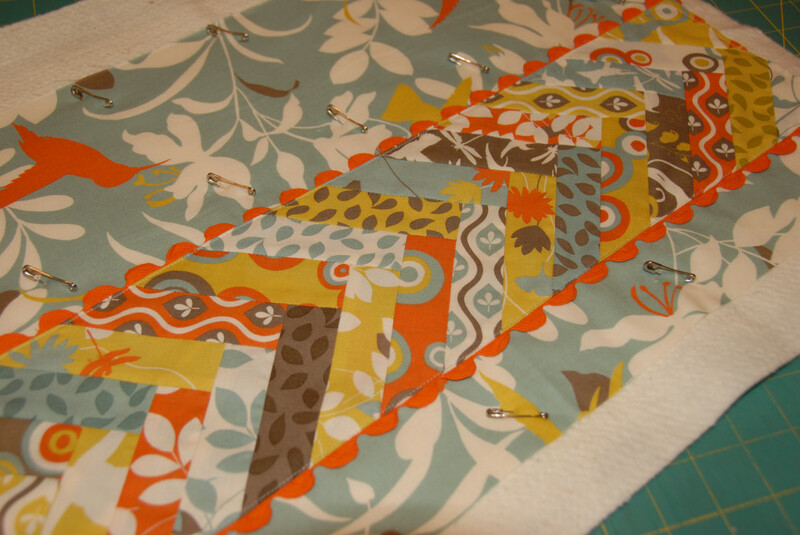 Pin and sew them to the top and bottom of the quilt top. 17. 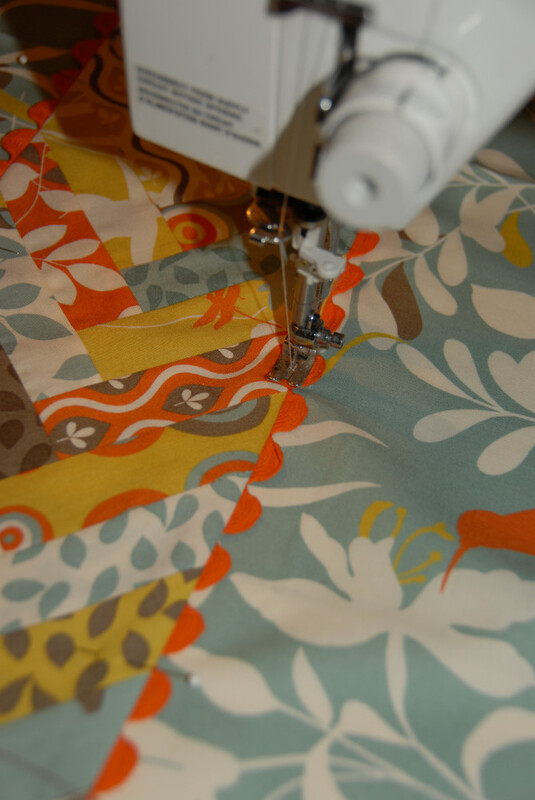 Measure the quilt top through the center vertically to determine the side border measurements. 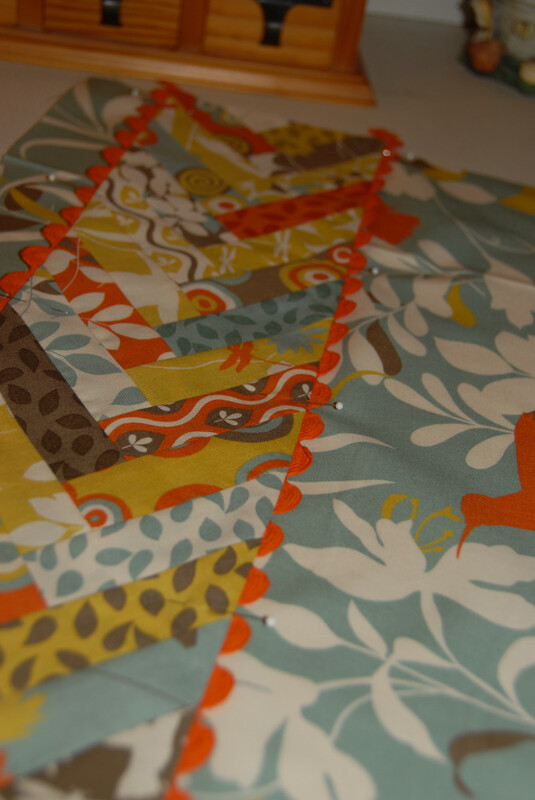 Cut the remaining two borders to that length and pin and sew them to the quilt top. 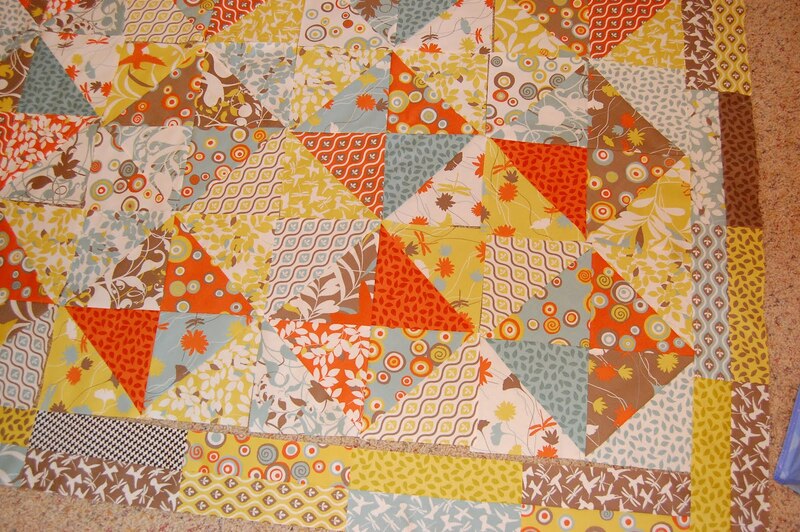 Press the seams and you are all done with the piecing! 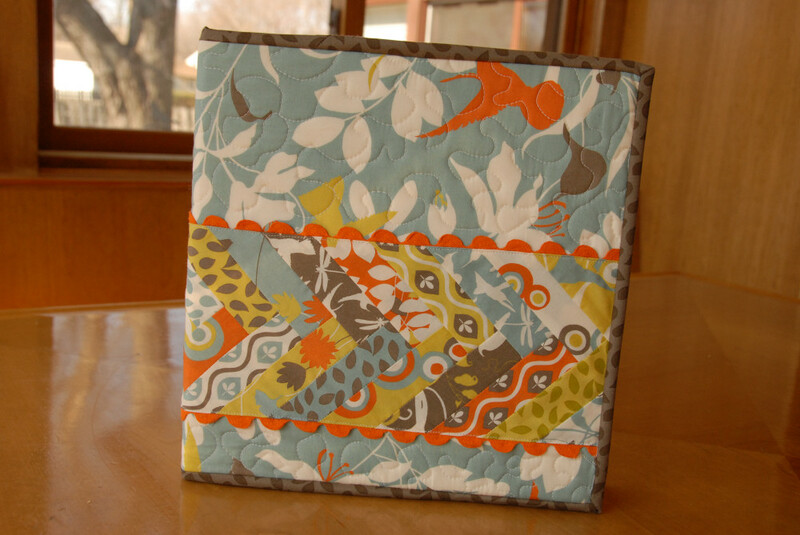 Quilt and bind and enjoy! 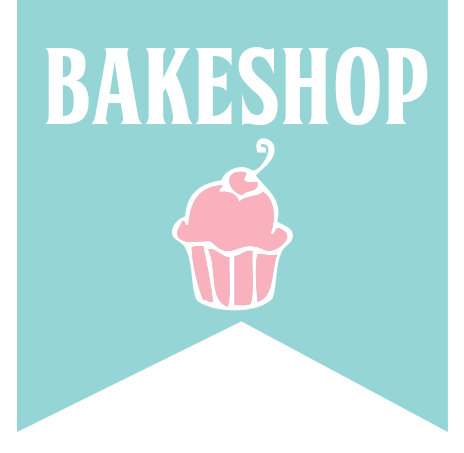 Thanks for checking out my tutorial and if you want to check out my blog or website, that would be great too! 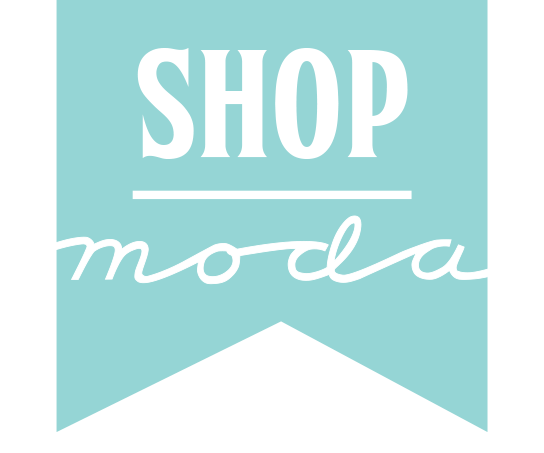 A special thanks to the great folks at Moda/United Notions for all of your support! 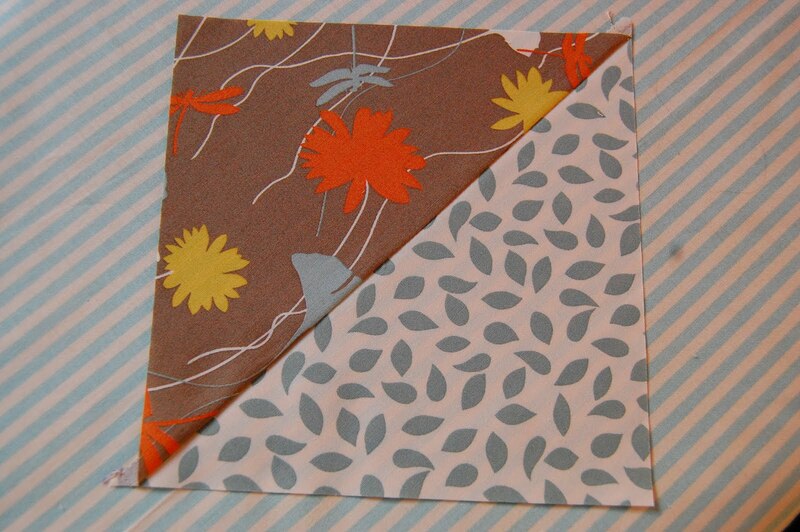 From the charm pack, cut strips 1 1/2 inch wide x 5 inches. (I used about 46 pieces for mine.) You can leave the pinked ends on them. They will be trimmed later. 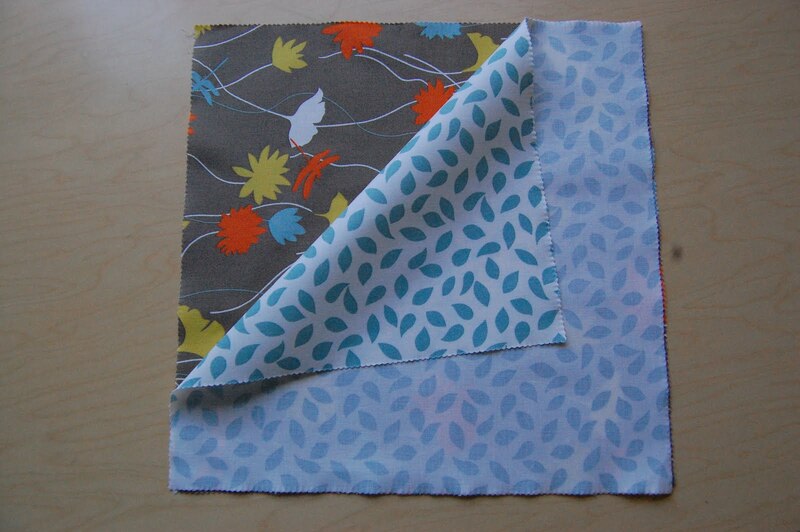 Sew your first two 1 1/2 x 5 inch pieces together as shown in the photo. 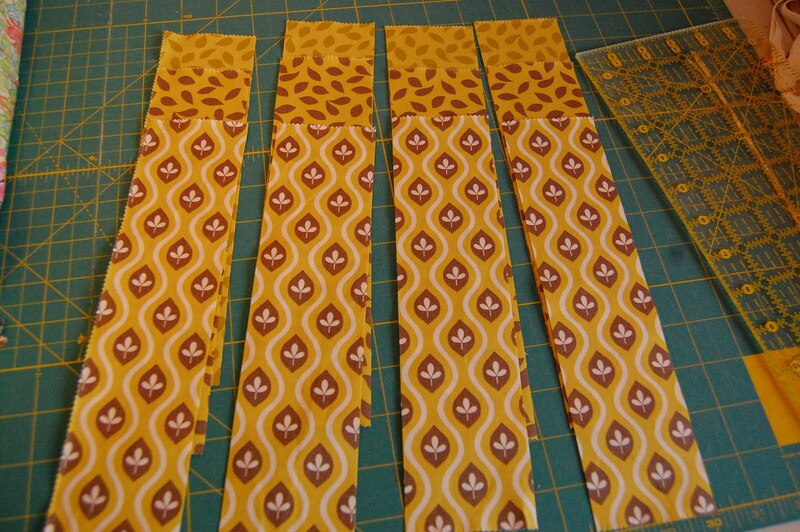 Continue to add 1 1/2 strips until your braid piece is longer than the width of your large scale print piece. Trim the uneven edges as shown. Cut both ends of your braid piece straight, leaving them a little longer than needed. 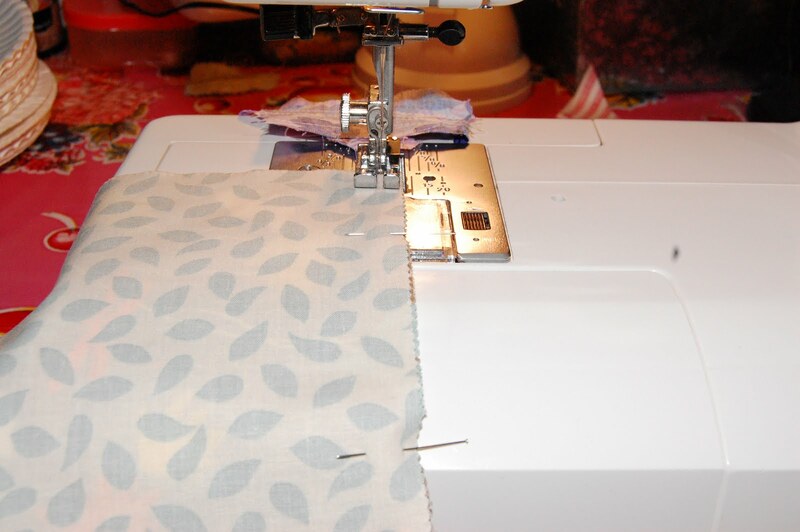 Sew the ric rac on the long sides, 1/4 inch from the edge. Press, turning raw edges under. Pin the bottom edge of the braid piece 2 inches from the bottom edge of the large scale print. Topstitch both long edges to the large print piece. 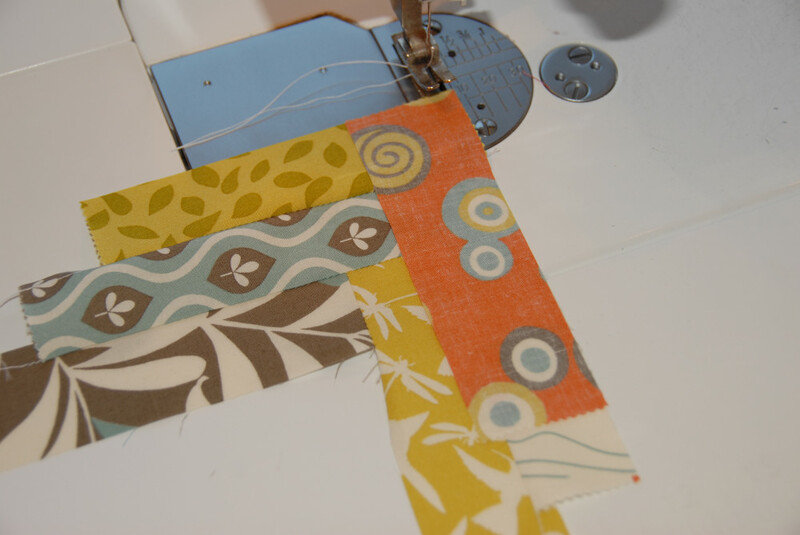 Layer your backing, batting, and top and quilt as desired. I just did a quick meander, and left the braid section unquilted. 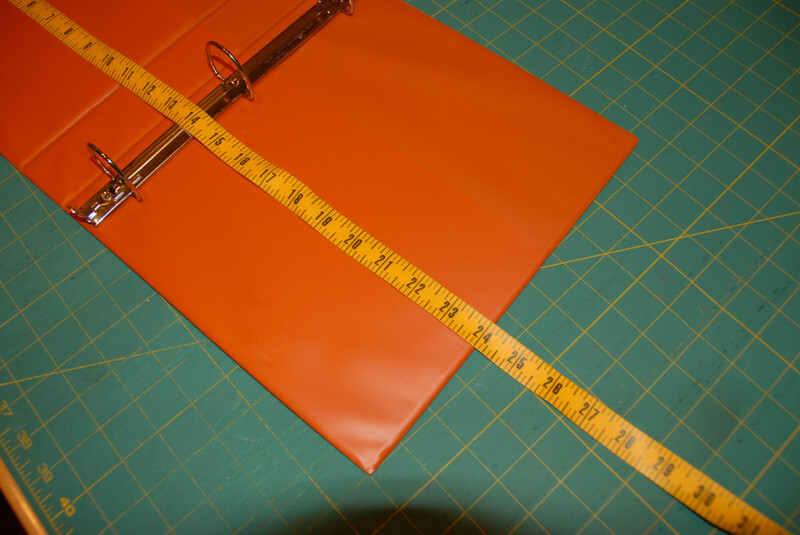 Carefully measure your binder and cut your quilted piece 1 inch taller and 1 inch wider than the binder. You now have a cute little mini quilt! Cut your pockets the height of your quilted piece by 16 inches. 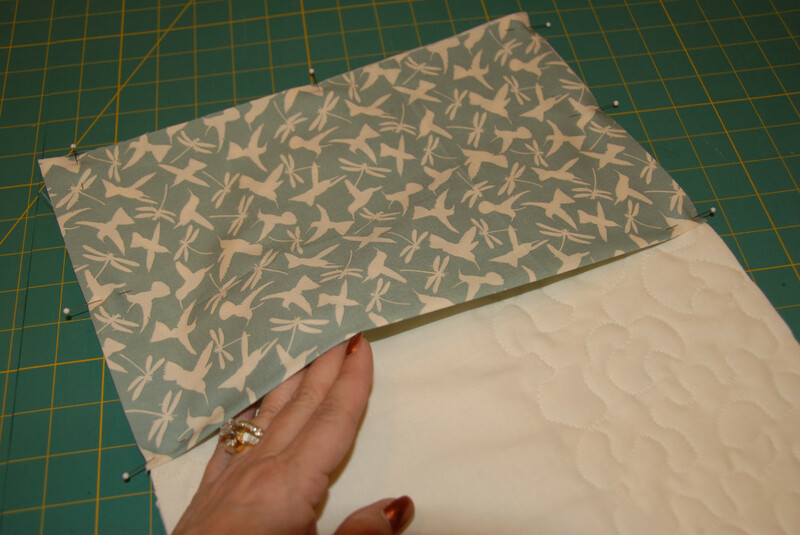 Fold in half so the piece is 8 inches wide and press. 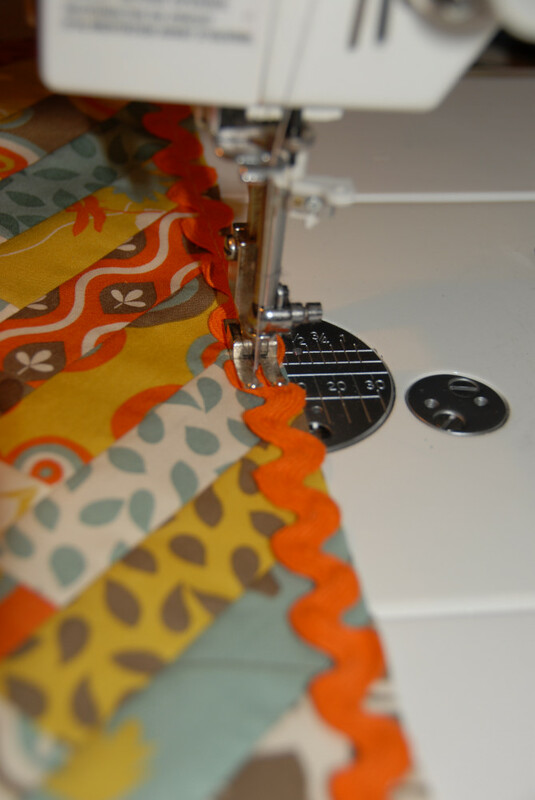 Pin the pockets to the back of your quilted piece as shown. The fold should be to the center. 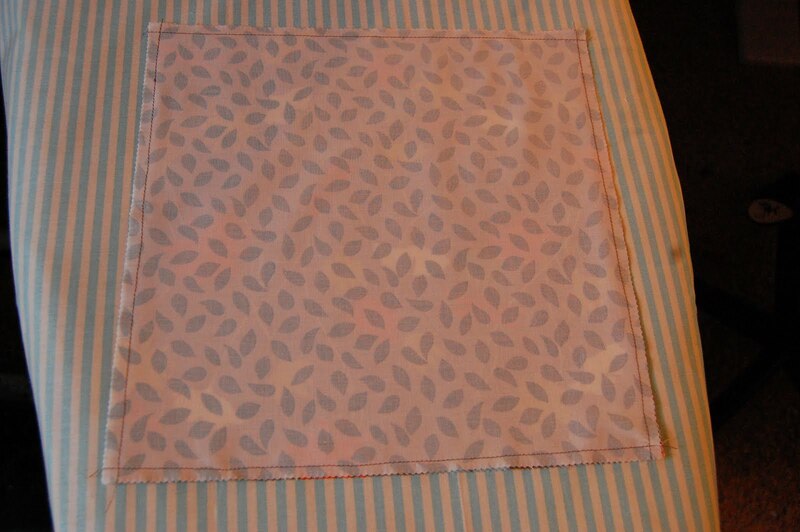 Stitch the pockets down a scant 1/4 inch on three sides, leaving one side open for the binder. 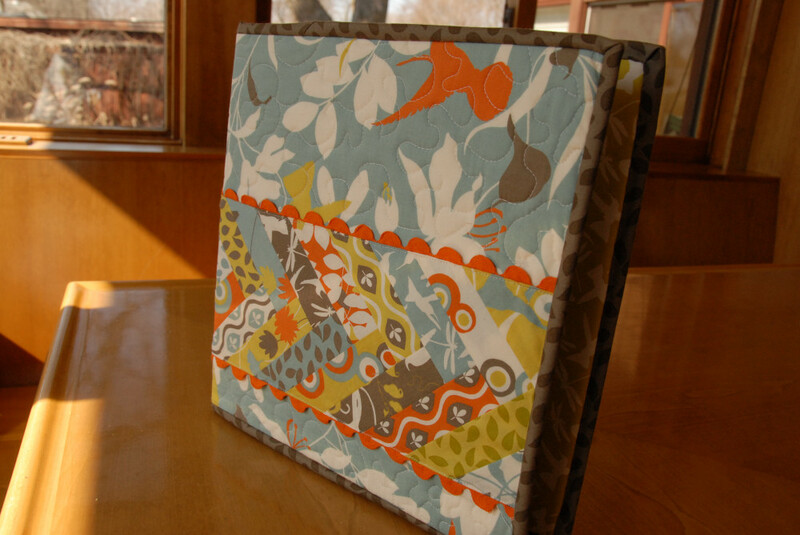 Cut your binding 2 1/4 wide and press. 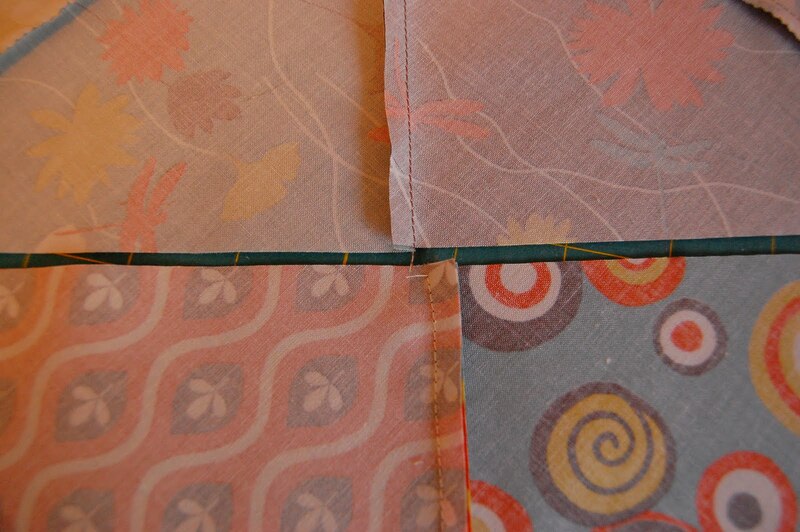 Sew binding to the quilt cover. 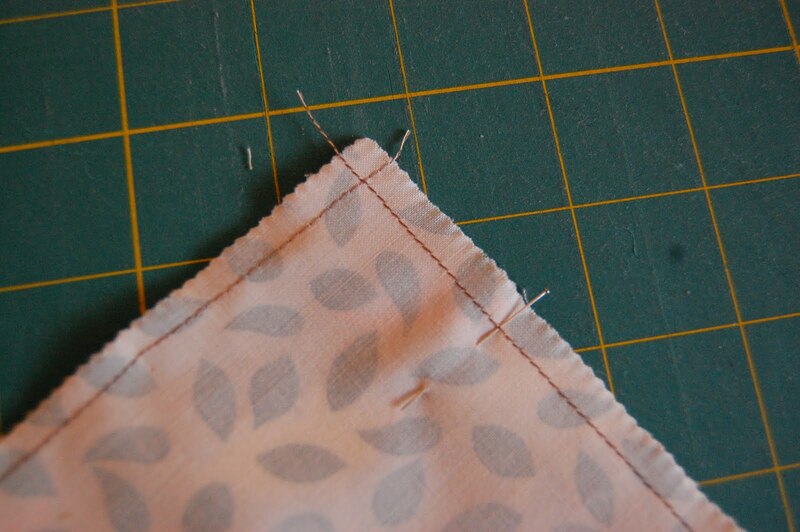 Hand stitch your binding to the back side. 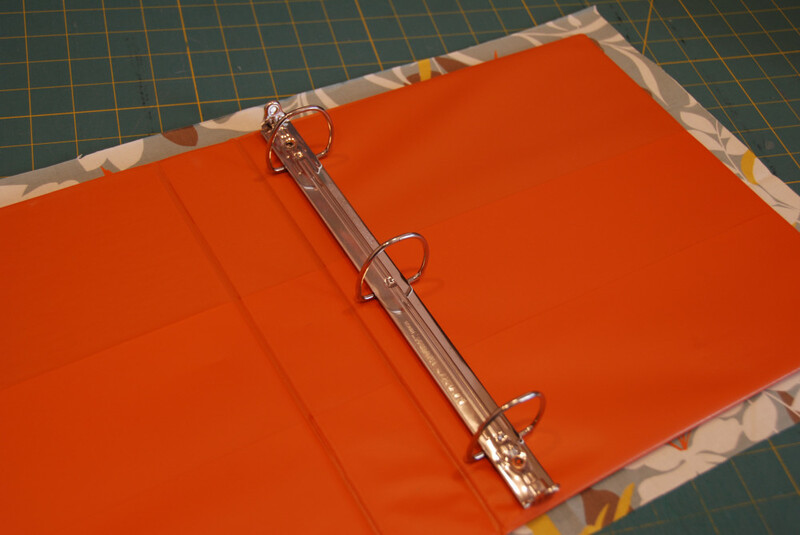 Slide your binder into your cover. Sit back and marvel at how cool it is!!! I purchased photo pocket pages for mine and I’m using it for a wedding shower gift. 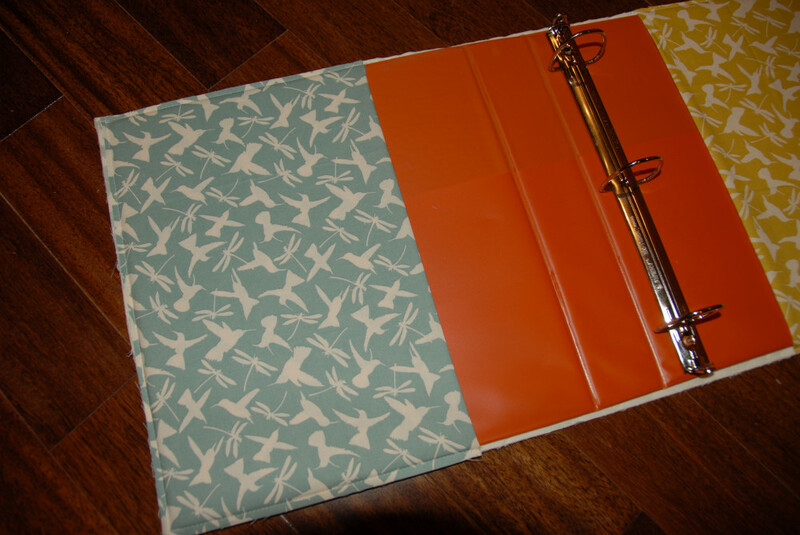 There are a million ways to jazz up those binders. All you need is a quilt the size of your binder. It could be pieced, appliqued, embroidered, monogrammed. Just use your imagination! If you send me photos, I’d love to feature them on my blog! One very funky binder cover. I dare you to make just one!